A Hawaii health system adopts a refreshing approach to address documentation issues. Any health care professional who has watched the evolution of EHRs over the past decade is familiar with clinician outcry related to negative workflow impacts. It’s a primary driver of recent efforts by the Office of the National Coordinator for Health Information Technology to develop a strategy that will reduce physician administrative burdens. While many are quick to blame EHRs, a July 2018 article in the Annals of Internal Medicine suggests that it’s the approach taken to documentation that may be the real culprit. Building on that premise, Hawaii Pacific Health, a not-for-profit health system, embarked on a journey to identify and eliminate meaningless documentation tasks and improve workflows. The effort culminated in the launch of “Getting Rid of Stupid Stuff” in 2017. As of late 2018, the organization had approved 87 requests from nurses and physicians to eliminate documentation processes with 29 additional requests in progress. Another 46 requests had been assigned to work groups. Beth Wolf, MD, a physician adviser to 3M Health Information Systems and the medical director of HIM for Roper St. Francis Healthcare, notes that the initiative represents the kind of “culture of curiosity” needed from today’s progressive, forward-thinking health care organizations. The project was birthed following concerns that the organization’s EHR made it easy to click on a response and move on without really considering what was being documented. 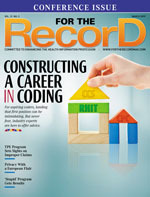 For example, Ashton points to a feature added after the EHR was deployed in the documentation workflow called the rounding row, which was initially designed to monitor whether rounding was actually occurring. However, the organization found that nurses were choosing the first item on a list of possible choices to document that they had done hourly rounds on their patients. In another example, an emergency department physician requested a review of a process that entailed printing an after-visit summary, having the patient sign it, and scanning the document back into the system. The team queried other health systems and the legal team at Hawaii Pacific Health about the value of the signature and determined it was not needed. Subsequently, they were able to streamline the workflow. • documentation that was required but clinicians did not understand the requirement or the tools available to comply. Since the program began, requests have been received for all categories; some requests were addressed with quick fixes, others sent to work groups, and some denied due to patient care, operational, or compliance issues. One of the most interesting findings, according to Ashton, was the program did not receive as many responses from physicians as expected. Currently, optimization teams—which teach staff EHR tips and tricks—are soliciting more input from physicians. Wayne Crandall, CEO of NoteSwift, finds that it’s more likely for administrative teams rather than physicians to seek help with workflow issues. “Physicians don’t want to change what they have already learned. Physicians do complain about these issues, but they don’t have the time to impact it,” he says. Can ‘Stupid’ Be Eradicated in Other Organizations? Industry professionals are quick to point out that with the right backing, the same process improvement initiative created by Hawaii Pacific Health can be replicated at other organizations. The key, according to Wolf, is having a robust change management strategy that supports end-user satisfaction. In short, engaging those working in the trenches. For example, Anders says that rather than requiring physicians handle all documentation, have a nurse meet with the patient to document the patient’s health status. Then, the physician can focus on the critical questions required to make a diagnosis or to optimally treat the patient. “By examining existing workflows and identifying the skillsets of individuals, practices can more appropriately assign various tasks and save physicians a tremendous amount of time,” Anders says. Even though a change is not feasible, there’s value in hearing staff concerns, Ashton says. Through those insights, it’s possible to better educate staff as to why certain documentation processes are important. Wolf believes that balancing compliance with the burden of documentation processes can be difficult for many organizations. She emphasizes that if physicians were skilled at documenting before EHRs, they have likely made a “decent” transition to electronic workflows. If not, then EHRs amplify the problems. Ashton hopes that new reimbursement models will drive down administrative burdens. She points to the example of a physician colleague who works for two institutions but takes different approaches to documentation. When he bills for an interaction, his notes are more extensive. In contrast, his documentation burden is less within a bundled payment system. “Additionally, we know that in other countries where the same EHR system that we have is used, their burden of documentation is far less than ours, suggesting that an awful lot of what we do is driven by our payment system,” Ashton says. Industry professionals agree that HIM is critical to any process improvement initiative related to documentation. Speaking about her own HIM department, Wolf says it is in a prime position to identify inconsistencies and inefficiencies. In addition, it is poised to become the recipient of positive outcomes when processes are improved as a result. Ashton says that due to the success of Getting Rid of Stupid Stuff, the program has been extended beyond the original EHR focus to other parts of the organization. “Early on, one of the leaders in HR said, ‘We have stupid stuff, too,’ and they committed to finding it with help from their staff,” Ashton notes.